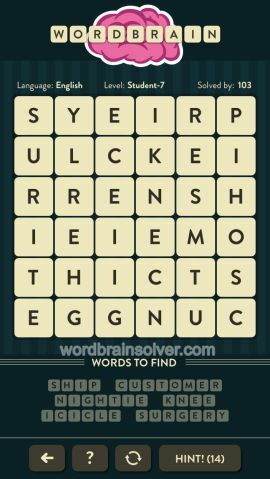 Wordbrain Student Level 7 Answers and Solutions. This is not the letters I have. There is no h for nightie no 2 r’s for surgery how can I send you my layout?? And you cannot skip it and go to next level so I am stuck !!! Section instead of nightie works. Surgery will e the last word solved. Ship,knee,icicle,customer, section, surgery. I have different letters for game 7 in goldfish level . customer,ship,knee,icicle fit in and surgery could fit but nightie can’t fit in.